Who are the CIC campers? CIC campers in 2nd through 9th grades can enroll in any session at camp. Campers in 1st grade may enroll in our one week sessions. The Camper in Leadership Training (CILT) program is open to campers in 10th grade. See the CIC News for detailed info about the CILT program. Our campers come prepared to make friends while participating in vigorous, exciting activities. All over the United States! While the majority of our campers are from Southern California, we have many campers from around the country and the world! We have one, two and four week sessions. Most campers come for two weeks. The two-week sessions include an out-of-camp overnight for campers entering 6thgrade and older and an in-camp overnight for younger campers. All two-week campers participate in our Badgework program that encourages campers to build skills in activities of their choice. Four-week sessions include a day trip to Avalon. Catalina Island Camps arranges transportation from San Pedro to our camp at Howlands Landing. The fee for this transportation is included in your tuition. We depart from San Pedro in the afternoon and return in the late morning. Specific information about departure and arrival will be sent at a later date. What do campers do from outside the Los Angeles Area? We have several campers each session from other parts of the United States who arrive in Los Angeles via airplane. Campers are met at the airport by our staff members and escorted to the boat on a charter bus. On the return from camp, our staff members accompany campers from the boat back to the airport and ensure they safely board the appropriate flight. In order to facilitate the safe arrival and departure of these campers, we require that flight arrangements be made through our travel agent. The fee for this service is $75.00 per camper and includes the travel agent’s fee. 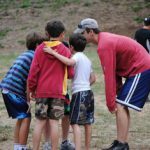 What if my child wants to attend camp with a friend? Campers are placed into cabin groups according to the grade they will be entering in the fall. If you wish to have your child placed in a cabin with a friend, please indicate this on your enrollment form. Both campers should be within a year of the same age. If both campers are not entering the same grade, they will be placed according to the grade of the younger child. Cabin requests must be made by all families involved to guarantee that the request will be honored. We cannot guarantee that groups of more then four campers will be placed together. Camp food has such a bad reputation…how does yours compare? We are fortunate to have an excellent Food Service Manager and staff, and they receive rave reviews each year from our campers! Breakfast each day consists of a hot entrée as well as a fresh fruit and dry cereal bar. At both lunch and dinner there is a salad bar in addition to the entrée. We have many campers and staff who are vegetarians, so most of our meals are prepared as meat “add-ins.” For example, when we have pasta, it is served dry, and the campers can choose between a marinara sauce, a cream sauce and a meat sauce. In the event that an entrée includes meat, a vegetarian option is available. Other special dietary needs can be accommodated as well; please call our office for more information. This sounds great! How do we sign up? To enroll your child in camp for this summer, click on the “Sign Up Online” button. All balances are due by May 1. All enrollments after May 1 must be accompanied by full payment. The camper medical form and store deposit are also due by May 1. How soon do we need to sign up? Our enrollment works on a first-come, first-served basis. The online registration system will only allow you to register for sessions that have space. If you are interested in a session that does not pop up when you try to enroll your camper, please contact our office for information about the wait list. What happens if the session we have selected is already full? The online registration system will not allow you to register for a session that is full. You can select another session or contact our office for information about the wait list. To place your child on a wait list, please contact our office. If a space becomes available, we will contact you to confirm your continued interest in the space. 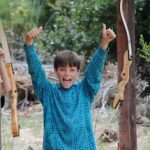 How does the camp program differ for the various age groups? The majority of our camp activities are available to all of our campers. Some exceptions: the high ropes course (entering 5th grade and above); day trips (entering 8th grade and above); and water skiing or wakeboarding (entering 5th grade and above). All campers participate in Power Boat activities (i.e. tubing or knee boarding) but the youngest campers usually do not try water skiing or wakeboarding. Please call our office for more information. 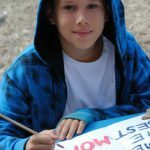 Can my child choose his own schedule? We are a group-centered camp. Our campers are placed into cabin groups according to their grade, and are scheduled to do activities as a cabin group. During a two-week program, Wednesday through Saturday of the second week is set aside for badgework, where campers can choose the activities they want to spend more time in. Does my child have to participate in all of the activities? At Catalina Island Camps we use the philosophy of Challenge by Choice. 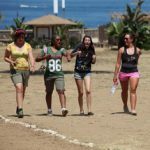 While we hope that the activities at camp will be exciting to all campers, our experience is that some campers have hesitation towards one or more camp activities. During staff orientation, our camp staff are given many tools for encouraging campers to participate in activities. Campers are never forced to participate in camp activities. We do have a minimum standard of participation for all camp activities, which includes putting on any equipment used for the activity and following the basic instructions of the instructors. Usually, through positive encouragement and preparation to participate, campers will try an activity. Our instructors are trained to allow a child the option to not participate if the camper has gone through the minimum standards of participation.